Want to become a real estate agent? Coaching and training are essential aspects of building a successful real estate career. 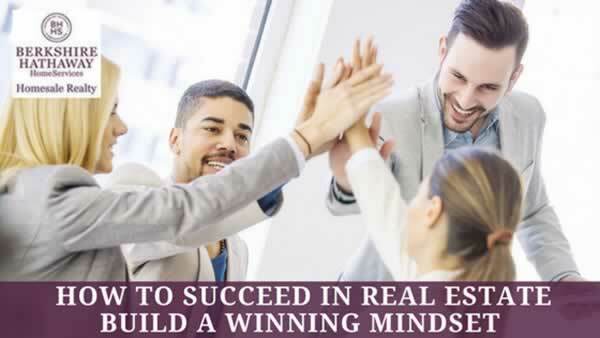 No matter if you are new to real estate or launching a fresh leg of your journey, one thing will become clear quickly: A winning mindset is essential to success. That means confidence, clarity, and focus. Still, it’s important to understand “mindset” isn’t just telling yourself nice things in the mirror. In fact, this feeling of certainty – of knowing you can handle whatever this career throws at you – comes from many aspects of your personality and training. Why a career in real estate? Simply, lots of professionals don’t really have a chance to help others make positive changes in life. Real estate experts are different: You play a key role in helping your clients achieve an important life milestone. For many of them, home ownership is the “American dream.” That alone should give you a boost when the going gets tough. Everyone is going to have days when they run into problems. The key is that you have “done the homework” and don’t get stumped when these situations pop up. The more you learn about real estate–and your local market in particular–the more you will be able to come through when it counts. Read up, network, and see what’s working for your colleagues. Worst case scenario: You make a mistake that has a tangible effect on a client’s house-hunt. Of course, you should do everything you can to set things right and navigate those troubled waters. But, here’s the key: You learn more by diving in and letting yourself own those situations than you do by shrinking back. “Lessons learned” can give you unique real estate insights. Mentoring is a huge part of success in real estate. Those who are just joining the profession will get on their feet the fastest when they can learn from those who’ve been where they are. Real estate agents who are hitting their stride should start sharing information about their specialties. Learning how to explain topics to others will make you more effective in the long run. Whether you’re working as part of an agency or on your own, there will always be more for you to do. The key is to set goals that are plausible, but still call for you to stretch. An attainable, yet meaningful goal will keep you moving forward. Be flexible and try not to get too bogged down in process: Instead, ask yourself: What will reaching this goal really mean for me? Once you have been through a few dozen clients, you will start to see situations that seem routine. Always bear in mind that every client has a story and specific goals. Your ability to build rapport and trust with your client is what sows the seeds for success in the long run: After all, they will be the ones referring friends and family to you in the future. Join BHHS Homesale Realty and you’ll have abundant opportunities to put these ideas into practice. We focus on providing education, technology, and tools that will help you become a real estate agent with confidence and a winning edge. Contact us to learn more. Posted on September 13, 2017 September 13, 2017 by Homesale Agent BlogPosted in Life as a Realtor, Real Estate TipsTagged real estate careers.